Story of the Week: Ride the Bus with What’s the Flux? Al Brown is homeless. He doesn’t always know where he’ll sleep at night, but you can count on seeing him every morning on the 202 bus, making his way to college classes and the future. 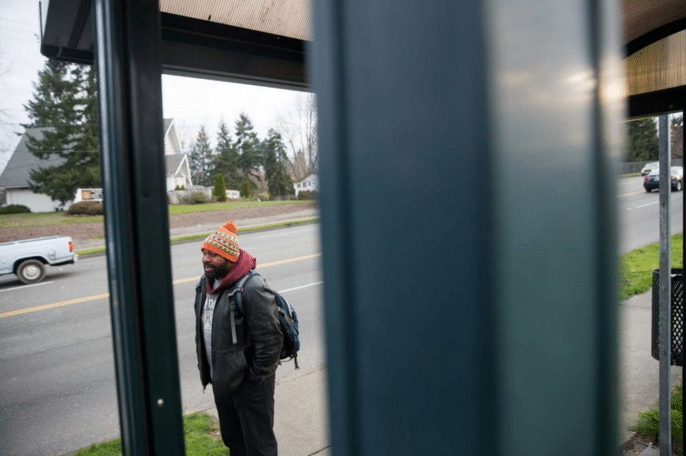 Brown opened up his commute to What’s the Flux: Commuter Dispatches producer Whitney Henry-Lester and Seattle Post-Intelligencer photographer Grant Hindsley for our story of the week. Listen to find out what Brown listens to on his long bus rides (hint: don’t stop believin’ ), and to hear the advice from a mentor that got him through many nights spent at the homeless shelter. See more photos at wtfluxcommuterdispatches.com. What’s the Flux: Commuter Dispatches explores mobility, access and economic movement from the margins of a city to its center through the daily ritual of the commute. With broadcast, texts, social media, ‘zines and more, What’s the Flux and KBCS are bringing curiosity to hidden, nonstop migration in Bellevue, Washington. Follow Lead Producer Mona Yeh on Twitter and Instagram.